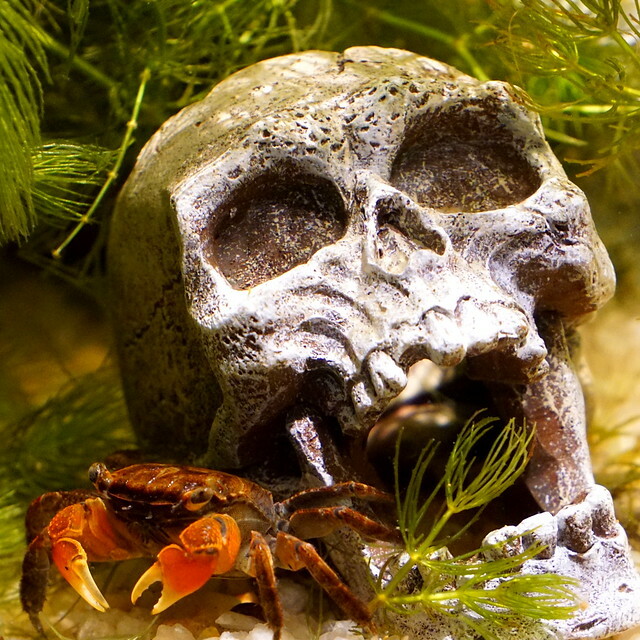 Invertebrates like shrimp, crayfish and crabs are big favorites in the aquarium hobby. And for good reason! There are many species that are very easy to keep, and also quite a few that do well in smaller tanks. They are fun to watch and some even have a bit of personality. So what are the easiest inverts to keep in our aquariums? There are multiple shrimp species that are very easy to keep in the aquarium. Shrimp are fun to watch and have a low bioload, meaning you can keep big groups. In need of more ‘shrimpspiration’? You can find a list of 10 fascinating species on Aquariadise here. Although not suitable for aquariums under 10 gallons (38L), Amano shrimp are a fantastic addition to peaceful tropical community tanks. They are bigger than dwarf shrimp, which means there is less risk of them being eaten by your fish. They also don’t breed as easily, which can definitely be an advantage if you don’t want 500 shrimp within a year. Amano shrimp are a big favorite among aquascapers because of their effectiveness as a clean up crew; in groups of at least five, they’ll help remove leftover foods and eat unwanted algae. Tankmates won’t be bothered and no specific water values are needed. You can buy Amano shrimp online here. You can find a complete Amano shrimp caresheet here! Cherry shrimp are among the most popular shrimp species, which is not surprising. They are easy to keep, colorful, they breed easily and make a great clean up crew. Any filtered aquarium of 5 gallons (18L) or more is usually enough for a colony to thrive, so no need for a big tank. Cherry shrimp make a great option for beginning aquarists looking for their first breeding project. Following the process from the female becoming saddled (yellow coloration appearing in the ovaries, indicating she’ll be reproducing soon) to the fry hatching and growing is simply fascinating. If your cherry shrimp share an aquarium with more aggressive fish like gourami, be sure to add plenty of hiding places to prevent them from being eaten. A healthy colony will usually be able to withstand the occasional casualty, but keep in mind that many carnivorous fish species can wipe out your entire group of cherries in no time. Choose tankmates carefully. You can buy cherry shrimp online here. You can find a complete cherry shrimp caresheet here. It’s not difficult to imagine why Crystal Red shrimp are among the most popular dwarf shrimp. Their coloration is stunning and they’re easier to keep than many other of the beautiful varieties of Caridina cf. cantonensis. Although Crystal Reds are not overly fragile, it is still very important that the water is kept clean and the aquarium is cycled. Lower quality (B and C grade – check out this guide for the grading system) Crystal Reds are usually stronger than high grade ones, as they are less inbred. Keep your Crystal Reds with non-aggressive tankmates (a dedicated shrimp tank would be best) and you may actually see some offspring after a while. Not into the Crystal Red’s candy cane pattern for some reason? There is also the Crystal Black shrimp, which looks exactly the same but with black and white stripes rather than red and white. This variety is slightly less commonly kept but still not too hard to find. You can buy Crystal Red shrimp online here. As a keeper of dwarf crayfish, I can guarantee that these little critters are a fantastic choice if you’re looking for a fun invert with some personality! They are interesting to watch and always up for a fight, even the dwarf varieties. You can find a more extensive list of freshwater aquarium crayfish here. Dwarf crayfish are smaller versions of regular crays. They are appreciated by aquarists because they’re a lot less aggressive than their larger cousins like Procambarus alleni (described below). Unlike this species they can actually be kept with many non-carnivorous tankmates. The most popular variety is the CPO (Cambarellus patzcuarensis “Orange”), bred specifically to be bright orange. Most other dwarf crays like Cambarellus shufeldtii and montezumae don’t have the bright color, but they definitely don’t lack personality. They are always ready to come running towards you with raised pincers whenever you approach the tank. An 8 gallon (30L) aquarium can house 2-3 dwarf crayfish, but they can also be kept in tropical community tanks as long as they’re not combined with fish that are large enough to damage them. Provide your crays with lots of hiding places to keep them happy. I personally use shrimp caves for this, which they seem to love. You can find a complete dwarf crayfish caresheet here. 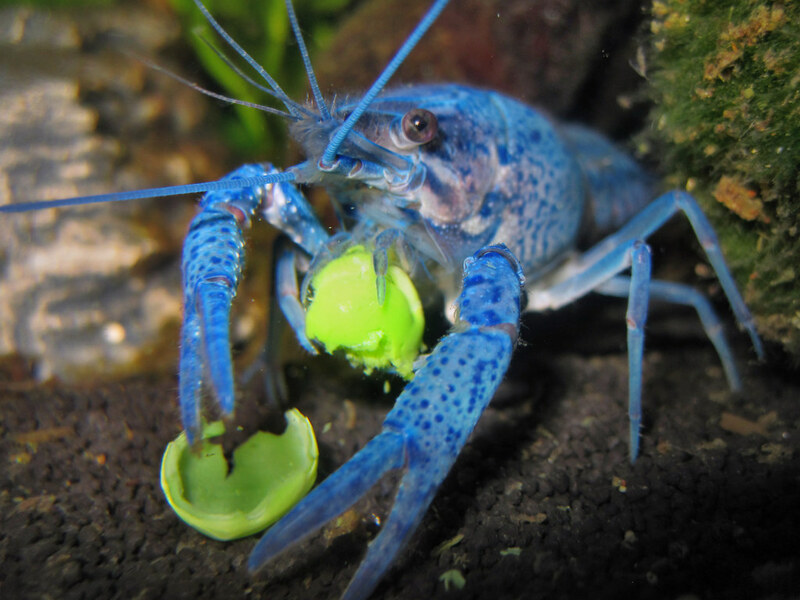 Although these bright blue crayfish are much bigger and more aggressive than the dwarf variety, which makes housing them a bit more complicated, they are not difficult to keep. As long as the water is clean, they can thrive in a pretty wide range of water values and temperatures. Because they are so big and aggressive, a larger aquarium (at least around 20 gallons/75L) is preferable. If you want to keep them with other fish, be sure to create enough hiding places and remember that they may try to catch and kill weaker and slower ones. The same goes for fellow crayfish. Setting up a special tank just for one or two of these crays may seem silly to some, but crayfish lovers agree that it’s 100% worth it, as these inverts have great personalities and show interesting behavior. You can buy electric blue crayfish online here! Many aquarium crabs require a more complicated setup with access to land and, in some cases, brackish water. Don’t let this scare you off! 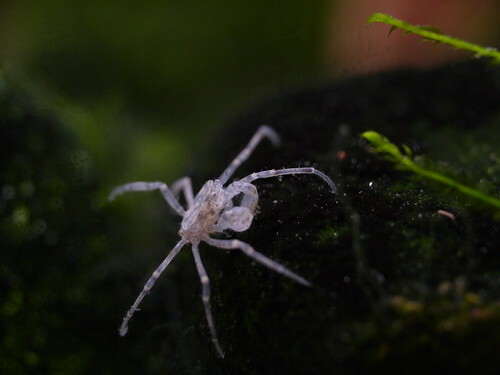 If you’re not sure how to set up and maintain a brackish aquarium, check out the guest post on brackish aquariums I wrote for Sitting By the Koi Pond or go for the tiny Thai micro crab, which is fully freshwater. You can even find a more extensive list of freshwater crabs here. Red claw crabs can be found in most aquarium stores. Contrary to what most fishkeepers assume, they are not fully aquatic and actually need access to land. A rectangular paludarium of at least around 15 gallons (54L) will keep your red claw crabs much happier than a regular aquarium. The aquatic part should be at a salinity of around 1.005 and a water level of at least 6 inch (~15cm); add a small filter and heater to keep the water clean and warm. Because these crabs are escape artists, close any holes in the lid of the tank and make sure they can’t climb to the top, or you might end up finding one on the floor! Red claw crabs are omnivores and will accept crustacean foods like Hikari Crab Cuisine (which I feed to all my inverts) as well as frozen foods, algae tablets and fresh veggies. You can find a complete red claw crab caresheet here! Although the amount of info available on these freshwater micro crabs is limited, they seem to be similar to dwarf shrimp in requirements. A minimum aquarium size of at least around 5 gallons (18L) seems preferable. Because they are quite vulnerable, it also seems to be a good idea to keep them alone or with peaceful tankmates like shrimp. Thai micro crabs like to hang out in floating plants, where they use their claws to filter small pieces of food out of the water. All this means that the key to success with these little guys is to keep everything very calm and peaceful. Breeding Thai micro crabs in the home aquarium seems possible, although it is very difficult to keep the larvae alive. You can buy Thai micro crabs online here! You can find a full Thai micro crab caresheet here. Were you missing aquarium snails in this article? If we’re talking about aquarium inhabitants that lack spines (also known as invertebrates) we can’t skip molluscs. There are many species of snails out there that can be kept in the aquarium. Some, like the algae eating black devil snail, are generally appreciated. Others, like the Malaysian trumpet snail, are despised by many aquarists for their fast reproduction and tendency to overrun your aquarium. Snails can assist in eating algae and leftover foods. Many species like to burrow, keeping your substrate aerated in the process. Above all, many species are surprisingly fun to keep! If you’re interested in keeping inverts, hopefully this article has given you an idea of which species are good to start with! If you have more suggestions for easy aquarium invertebrates or if you want to share your experience with one of these species, be sure to leave a comment below. I was thinking about setting up a 300L freshwater aquarium, with a couple of dwarf crayfish. Is it possible to have Cory catfish and small livebears with the mexican dwarf crayfish? If not, is there any other invertabrate that will not bother them? Hi! Sounds like an awesome tank. Yes, you can keep these together. I actually keep my Mexican dwarfs with dwarf shrimp and they don’t bother anyone. What do I need to turn an aquarium into a paludarium? I have just bought a 40 litre tank and I am thinking of keeping a variety of of fw inverts in it.Can you suggest a good combination? Will they breed?Can i keep fish and plants with them?What will they eat? i am getting a 10 gallon tank very soon,and i intend to use it for dwarf orange crayfish. i will give them a lot of hiding places such as flower pots. how many can i keep in this tank with out them turning cannibalistic,i am thinking i could keep about 4 in that tank since they get about no bigger than 3 inches and i will do a 2 gallon water change each saturday. I think 3 is a good number to start with. You can then just see how it goes and possibly add another one if you think it’ll work well! They are not too aggressive so I think 3-4 should work. Good luck! Dwarf crays are a lot of fun to keep. Nice post on inverts, I have been keeping reef tanks for decades but it has been a long time since I have had a freshwater tank. Planning on setting up a 75 gallon planted tank and doing research now on what plants, inverts, and fish to add. 75 gallons sounds like a fantastic size to restart freshwater at, there’s loads of possibilities! Some of the inverts mentioned here like dwarf crayfish and amano shrimp would be a very helpful addition to the cleanup crew. I love crabs, I wish there were a bigger variety of freshwater ones available- surely there must be lots of species around the world. And I had never heard of dwarf crayfishes before. The more peaceful nature sounds nice. I’ve kept the normal kind before and indeed they tend to view any fish as a potential meal. There are more freshwater species, like vampire crabs, but those require a paludarium as well and I’ve heard they’re a bit more difficult to keep so I decided not to include them! The article is about easy inverts after all, haha! And yes, dwarf crays are ideal if you want all the good parts about crayfish without the bad. They have the same fun personality but they leave almost everything alone. 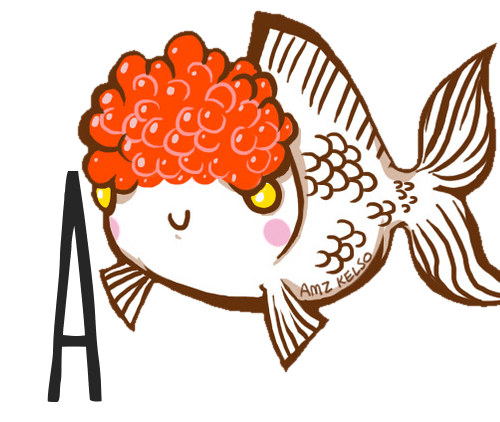 I even kept mine with cherry shrimp and they never bothered them!